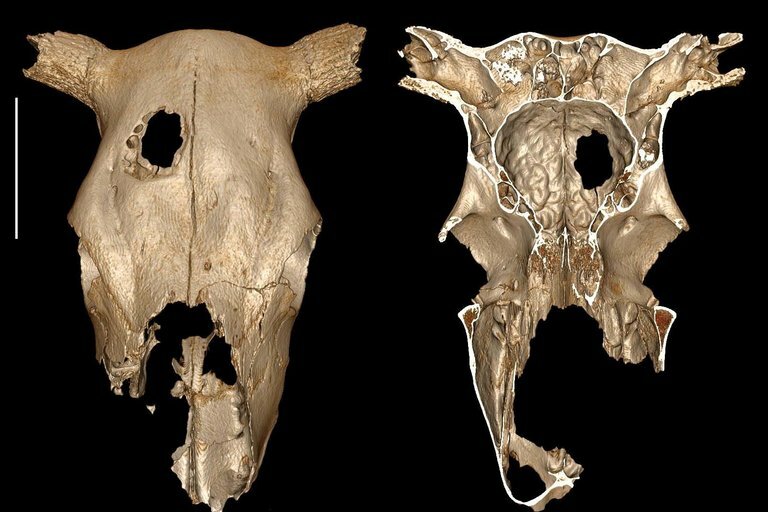 A cow cranium from the Neolithic Era appears to be the first evidence of either a veterinary procedure or a person practicing their human surgical skills on an animal. T	T	he history of early surgical techniques, from limb amputations to draining infected wounds, likely goes deep into antiquity and therefore is largely unknown. The oldest surgical procedure for which there is archaeological evidence is thought to be cranial trepanation that involved drilling a hole in the head to expose the brain in hopes of treating seizures, migraines, and mental disorders. While doing archaeological research online, biological anthropologist Alain Froment happened upon a photo of a cow skull in a 1999 paper in a French scientific journal. The 5,000-year-old skull appeared to have a trepanation hole, yet the study concluded that goring from the horn of another animal produced the gash that is about 2.5 inches long and 2 inches wide. "I was not convinced by the explanation of cow goring," Froment, a researcher at the Museum of Man, located in Paris, told Seeker. He and Fernando Ramirez Rozzi of the French National Center for Scientific Research analyzed the cow cranium and now believe that the Stone Age animal underwent trepanation. 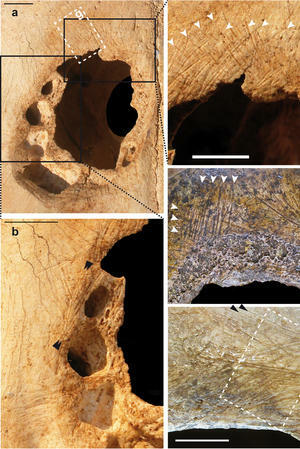 The findings, reported in the journal Scientific Reports, might be the earliest evidence of a veterinary surgery. Alternatively, the researchers propose that Neolithic people could have practiced human surgical procedures on already dead animals. If so, the almost complete cow skull could provide the earliest known evidence for such an activity. The fossil originally was found during archaeological excavations carried out from 1975 to 1985 at the Neolithic site of Champ-Durand at Vendée, France. By at least 5,000 years ago, this location near the Atlantic coast served as an important trade center for locals who specialized in salt production and raising livestock. In addition to cow remains, fossils for pigs, sheep and goats were also unearthed at the site. Many of the bones had either cut marks or were burned — some were cut and burned. To analyze the cow cranium in detail, Ramirez Rozzi and Froment created 3D reconstructions and studied them with a scanning electron microscope. They determined that the exterior of the hole becomes smaller internally, with borders of the inner and outer regions being irregular and not smooth. "The traces of scraping are from a stone tool and not a metal one," Froment said. He and his colleague argue that goring by another animal would have produced fracturing in and around the wound — characteristics absent from the cranium. They also negate the possibilities that the hole was produced by humans seeking bone for tools or by natural causes, such as a tumor or even intrusion by insects. The researchers instead argue that the almost square shape of the hole, the lack of any marks indicating pressure by an exterior force, and the presence of cut-marks around the hole all suggest that the injury resulted from a surgery. Since there is no evidence for healing, they believe that the procedure was performed on a dead cow, or that the cow did not survive. The location of the hole interestingly matches where trepanation procedures typically occur on humans. Froment explained, "This very place on the skull does not cause internal hemorrhage because there is no vein sinus under the bone in that place." Ramirez Rozzi told Seeker that evidence for trepanation is found all over the world and across multiple time periods. Froment clarified that the most ancient trephined human skull was found in the Ukraine and is dated to about 7,300–6,200 BC. In France, the most ancient trephined human skull is about 7,000 years old, he added. The researchers previously suspected that a Neolithic wild boar also underwent trepanation, but they could not directly study that particular skull. Although their paper presents a few different scenarios explaining the bone surgery, both authors favor the idea that Neolithic people practiced surgical procedures on animals before applying them to humans. Ramirez Rozzi said, "You see a great deal of expertise in human skull trepanation, and the question has always been, 'How could those who carried out these procedures have had the knowledge to do them so perfectly?' They certainly must have practiced before performing surgery on live humans." He then admitted, "This is a supposition, but it follows logical reasoning." It will be challenging to identify the remains for other animals that might have also been used during possible practice surgeries. As Ramirez Rozzi said, "Unfortunately skulls showing this practice would likely be lost among many other skulls. Hopefully more attention will be paid to the matter in future."